One of the aims of this book was to focus the attention of specialists to the diversity of the effects of the ionising radiation on biological and physical systems. Special emphasis has been placed on the exquisite complexities/differences introduced by high ionisation density versus low ionisation density irradiation in both biological and physical systems (Scholz – Chapter 1, Horowitz – Chapter 2, Olko – Chapter 3). As well we wanted to point out the need for novel experimental and theoretical approaches required to advance the important fields of micro and nanodosimetry. Important first steps have already been taken, for example, the accelerated application of semiconductor detectors in their various forms to microdosimetry and as well to practical, important applications in the radiation dosimetry of oncological procedures (Rosenfeld – Chapter 6). The vast number of applications of TLD to radiation dosimetry are not neglected; a special chapter is devoted to the application of TLDs to medical dosimetry applications (Mobit and Kron – Chapter 7) as well as a tutorial approach in an additional chapter to the cavity theories required to extrapolate dose from the detector medium to the tissue medium (Mobit and Sandison - Chapter 5). 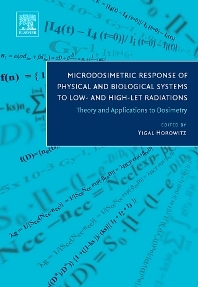 One of the major features of this book is the intensive, in depth, coverage of the theory and modelling of TL both from the solid state physics point of view (Chen – Chapter 4) and the microdosimetic point of view (Horowitz – Chapter 2 and Olko – Chapter 3). The many puzzling, quaint, quizzical features of TL science can now be understood in the framework of these advanced theoretical models, explained in straightforward, understandable terms. Medical dosimetrists in hospitals, health physicists, university and governmental researchers in dosimetry, radiation protection specialists, radiological physicists, graduate students/biophysicists/radiation physics/nuclear radiation science. Also TL/OSL materials researchers, international and national calibration and standardization laboratories, radiation biologists and industrual research and development. Ben Gurion University, Physics Department, Beersheva, Israel.